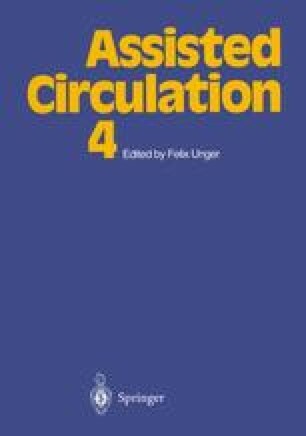 The intriguing principle of “counterpulsation”  introduced the possibility of affecting the circulation by separately interfering with the two cardiac cycles, systolic and diastolic. It derived from the observation that myocardial oxygen consumption depends on the myocardial time-tension index . If, therefore, pressure during ventricular ejection could be reduced, oxygen consumption could also be reduced, provided mean arterial perfusion pressure was maintained at the same level. This principle has been used in the only method of assistance to gain acceptance as a standard clinical therapy, intra-aortic balloon pumping .